Vietnam is one of countries in Indochina Peninsular and a country where has a rich long history. Vietnam is known as a country with the “S” Shape in the East Sea. You can come and visit Vietnam with many ways by Sea Cruise, airlines or train from China in the North. Vietnam is famous in the past for the war with French and America. Although it was destroyed by the war, it has been recovering and developing in all sides. With the strong-ness of variety of ethnics and cultures, beautiful landscapes, Vietnam’s Tourism is becoming the main economic department of the country. With the slogan “ Vietnam – A Destination for the new millennium ”, traveling to Vietnam you will have chance to see the changing of a developing country with hidden charms and friendly people. The first destination when you arrive Vietnam is Ha Noi capital city with the first impression of an ancient capital city is located in Red River delta has many lakes, parks, temples, pagodas and old quarter. Coming to Ha Long Bay World Heritage Sites with thousands of limestone rising from the water look like as the sculptures by hand of the nature which is a natural wonder. Having time to visit Sapa town is a great experience to explore various of minority people in highlands northern Vietnam. The most popular destinations in Vietnam are Hue – Hoi An and My Son. Traveling to these places is more opportunity for you to enjoy the special cultures, architectures of Hue – imperial city, Hoi An ancient town and Cham people in My Son. Combining to historial and cultural trip, relaxation time at beaches is a different feelings you should have. Lang Co Beach, My Khe beach, Nha Trang beach, Mui Ne beach and Phu Quoc islands beach are beaches recognized the most beautiful ones by famous newspapers in the world are the ideal places for you to have relaxation and enjoyment. Meanwhile Ho Chi Minh city is the busiest city in Vietnam where you will see an active modern one with pagodas, museums, markets… And a part in Vietnam destination is Mekong Delta which is a symbol of Vietnam tourism – a famous destination for travelers come to Vietnam to enjoy river life, floating markets, thousands small channels and fruit gardens during year. We are proud of to give you the best tourism products with friendly people, rich cultures and majestic natural landscapes as well when visiting Vietnam – a lovely country in southeast Asia. 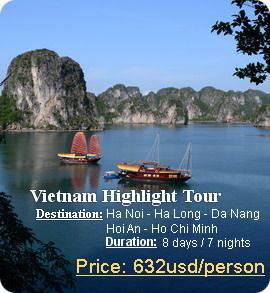 A throughout Vietnam Trip is a great experience you will receive from Vietnam – country & people.